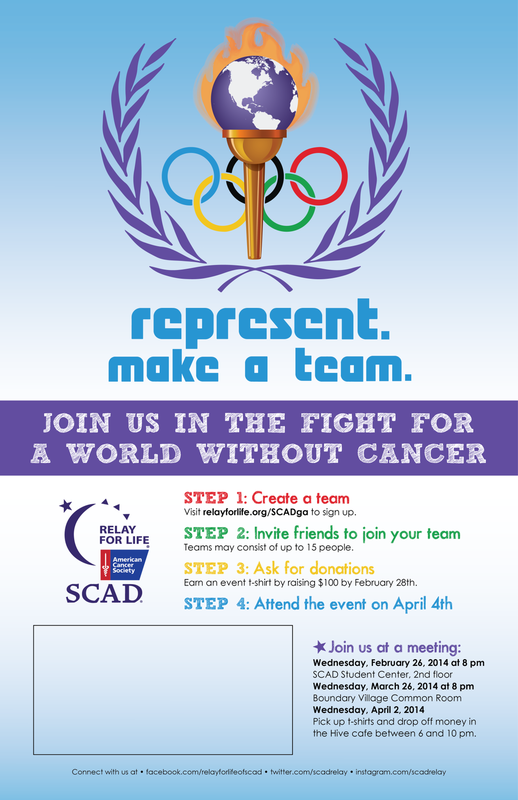 Just another update on what I’ve been up to lately – SCAD’s Relay for Life club! As the marketing chair, I designed and organized the distribution of sponsored coffee sleeves to cafés outside the academic buildings and just recently created a poster in honor of the Olympics. (The empty box is for an informational tear-off sticky note pad.) As a participant, I also formed my own Relay team this week; we’re called “Scrambled Legs” and we plan to have a baked goods fundraiser called “Scrambled Legs & Bakin’” – come on, it’s punny! If you would like to donate to my page, you can do so by clicking here. My goal is to raise at least $100 by the event on April 4th and I’d really appreciate your help in reaching that goal. Let’s all work together to finish the fight against cancer!